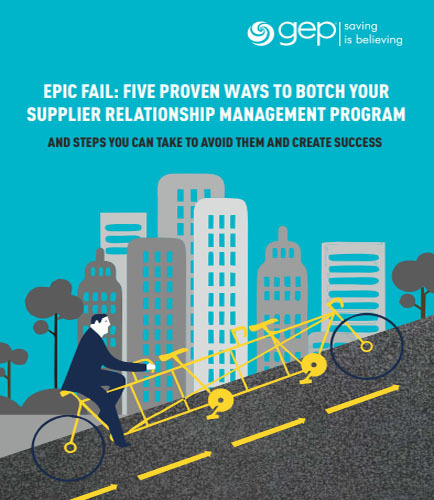 "Five Proven Ways to Botch Your Supplier Relationship Management"
programs – very few of these initiatives are truly effective or sustainable, primarily due to poor strategy and execution. Has the wholesale distribution segment of the supply chain become an unnecessary step in the sales process with the constant advances in marketing technology and the rapid growth of consumer self-service sales? Or has a new opportunity been created?Is the salesman dead or just evolving? Expanding to wholesale and retail distribution, makes it possible to verify the quality of products and processes and creating new operating methods, and simultaneously cut times to market and costs. Death of the Salesman:What does it cover? This whitepaper talks about the wholesale distribution system of the supply chain as a dispensable process or not. What's the cause of death for the B2B salesperson in the highly transactional world of wholesale and distribution? Are wholesalers/distributors doomed to be a thing of the past? Are wholesalers destined to be absorbed by their suppliers? How is it that the wholesale and retail distribution segment of the supply chain has become an antiquated business model in terms of client relationship management? How wholesale distributors can grow through a shift in their business models? Business intelligence is a technology-driven process in which variety of software applications are used to analyze organization’s raw data and presenting the information in actionable format so executives and business leads can make better decisions looking at them. Although business intelligence has some common functions, it includes three basic functions: data mining, data analyzing and data processing. Retail is sale that occurs when a business sells its service or product to an individual consumer. It can occur through a number of different sales channels which could be online, direct sales, mail or in a brick-and-mortar storefront.There are a large number of retail establishments across the world, from salons to gas stations and restaurants to stores. What is Pharma and Life Sciences ? The Pharma and life science industry continuously adapt and evolve with the latest technological trends like IoT, 3D printing, cloud and so on to meet the requirements in the industry. These innovations imbibe the potential to change the basics of the industry by offering improved patient and healthcare professional engagement, better services for patients, higher productivity and so on. The backbone of the Pharma and life science industry is its research and development (R&D) sector. Therefore, to meet the demands of the industry, companies are seeking methods to improve and enhance the R&D sector with the help of information technology.